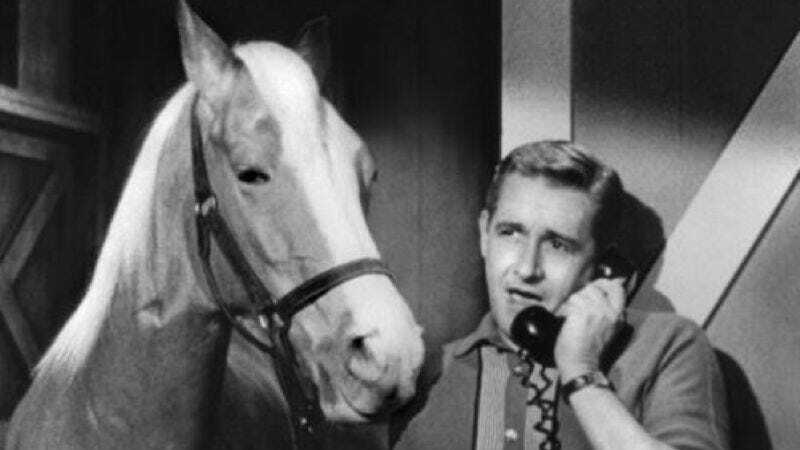 Unlike some recent classic TV adaptations, Mister Ed will be a straightforward “family film,” rather than a loose basis for brand recognition (like the forthcoming Father Knows Best) or an insulting meta-textual mess (Bewitched, The Smurfs, pretty much everything else). It will also revive the “talking horse” movie genre that’s been dormant pretty much since Bobcat Goldthwait’s Hot To Trot—which we’re guessing won’t even get a mention in the film’s press junket, unless we happen to be there. Of course, these crazy Millennials won’t rest until the entire TV Land lineup is made into a feature film. “Where is our generation’s Green Acres movie? !” they scream, their twitching, hyperactive fingers curling involuntary into tiny fists as they rain blows down upon the old and weak.